The closing ceremony of the 2016 Paralympic Games in Rio is taking place this evening [Sept 18], with all 160 countries being represented in the Parade of Nations by a single flag-bearer. Bermuda was represented by two athletes at these Games — sprinter Jessica Lewis and boccia player Yushae Desilva-Andrade – with Desilva-Andrade serving as the flag-bearer at this evening’s ceremony. Lewis, who was making her second Paralympic appearance for Bermuda, placed 6th in the 100m final and finished 11th overall in the 400m and 800m, setting personal best times in two of her events. Yushae Desilva-Andrade was also in action for Bermuda, which marked the first time the island has fielded a boccia athlete in the Paralympics. Desilva-Andrade matched up against Korea’s Jeong Min Sohn, and then competed against Israel’s Nadav Shlomo Levi, a match which went down to the wire, ending 2 – 2, with Levi winning the tie-breaker. This evening’s ceremony included a tribute to Iranian cyclist Bahman Golbarnezhad, who died in Saturday’s cycling road race, with a moment of silence held in his memory during the closing ceremony. The next summer Paralympics Games will be held in in Tokyo, Japan from 25 August – 6 September 2020. 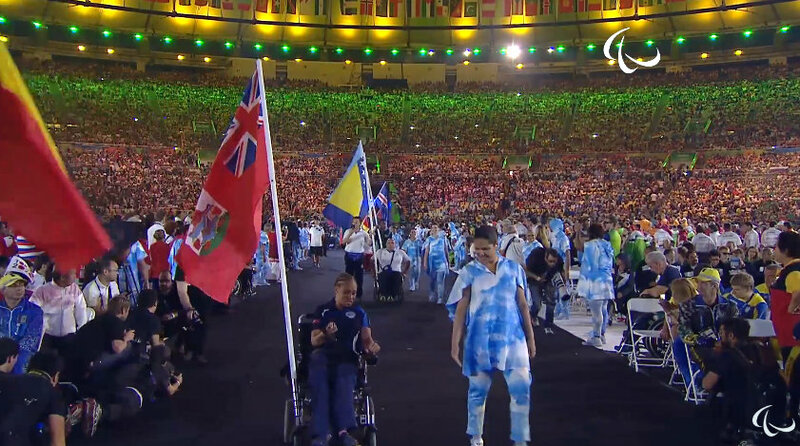 So happy to see Yushae Andrade deSilva carrying the Bermuda flag with such pride ! Congratulations Yushae and Jessica! You have made Bermuda proud! Unfortunately you didnt reach the podium but in my eyes you are still gold medal champions! I’m looking forward to seeing you compete in Japan in 2020 and hopefully resulting in a medal! I hope that you are welcomed back home with a warm reception! All the best to the both of you!